As part of a larger effort to decrease the amount of vacant and underutilized space within its downtown, in 2014 one Maryland municipality implemented a Central Business District Façade Program. This program, combined with enhanced marketing, a small business outreach program, and design funding from the Appalachian Regional Commission, led to improvements in the appeal, marketability, and aesthetics of a historic downtown and prompted new commercial lease signings. Another Maryland community leveraged over $800,000 in targeted state financing assistance to acquire and demolish eight blighted buildings and remediate hazardous material in a ninth. 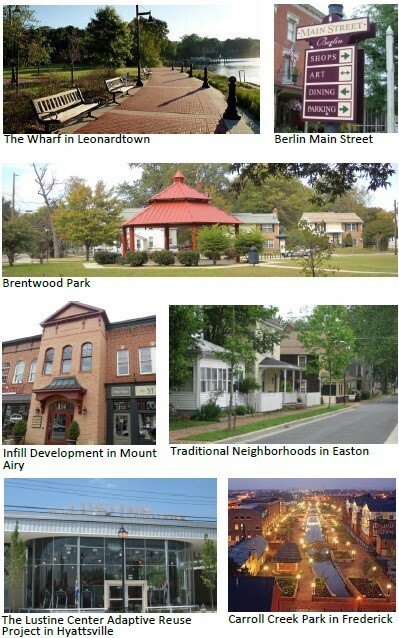 The dedicated collaboration of jurisdictions, the Maryland Department of Planning (Planning), and the Maryland Department of Housing and Community Development (DHCD) realized these stories of community revitalization success through the application of Maryland’s Sustainable Communities Program. DHCD manages the Sustainable Communities Program (Program); an inter-agency and cross-governmental effort. 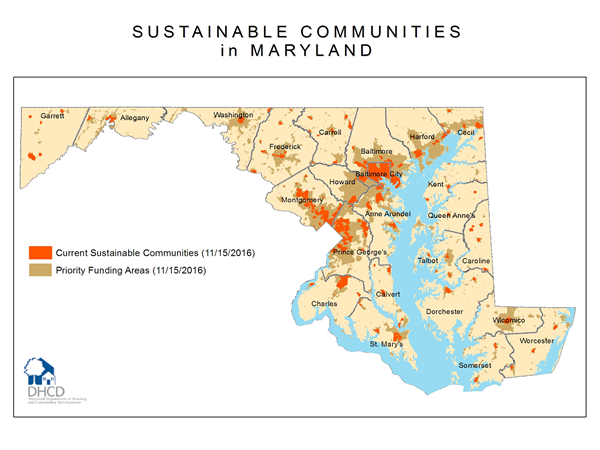 Initiated with the 2010 Sustainable Communities Act (HB 475), the Program creates a place-based framework for consolidating revitalization programs and incentivizing investment in Maryland’s older communities. The idea is to leverage state funding sources in specific areas of Maryland jurisdictions. It would be a mistake to assume that Sustainable Communities are only about the money, however. A tremendous amount of planning, project management, documentation, review, and revision go into the successful application of the Program, and this is where Planning contributes essential assistance. The department’s Planning Coordination division supports localities in developing and tracking their Sustainable Communities action plan. Regional Planners collaborate with local staff, officials, and a stakeholder workgroup to outline an appropriate area for designation, establish goals and objectives, target applicable funding, and draft a detailed and implementable action plan. This is just the first step. Once approved for designation the true work begins. Planning staff help localities monitor their progress, assist in plan and regulation changes, apply for funding, evaluate the course of their plans, and change direction as needed. The Program cannot be described as bottom up or top down; only as community driven and multi-dimensional. The Sustainable Communities Program is entering a new and exciting phase. Designations last for five years, and the initial ones are currently coming up for renewal. Planning, along with other state departments, forms a core team reviewing the successes and barriers of previous action plans. This team communicates regularly with jurisdictions and works with local leaders to adjust strategies best leveraging investment and advancing the established revitalization objectives. Beginning in the summer of 2017, inter-departmental teams will also begin reviewing Community Legacy and Strategic Demolition Fund grant applications around the state that help implement a community’s Action Plan. The Sustainable Communities Program is one prominent example of collaborative, ongoing, and strategic planning that builds capacity at the local level while strengthening department ties and combining missions at the state level. To learn more about the program, please contact Mary Kendall, Program Officer with the Maryland Department of Housing and Community Development, at mary.kendall@maryland.gov, or one of Planning’s Regional Planners.